This 1985 special starts off with Garfield jolted awake by WBOR-TV beginning its broadcast day. Unfortunately, their sign-on starts off with the annoying Binky the Clown. Despite this, Binky reminds Garfield today is Halloween. Garfield then sets about preparing to go trick-or-treating. 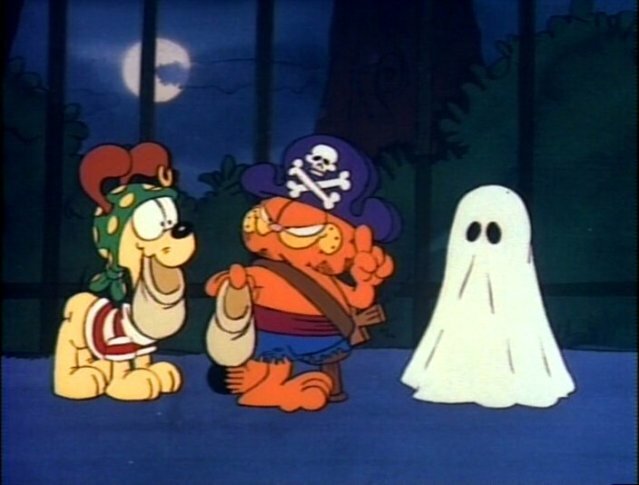 To increase the amount of candy he can haul in, Garfield brings along Odie. While things go well at first, they take a scarier turn once the cat and dog wind up in an abandoned house. Binky himself. This marked the clown’s first animated appearance, before he became a staple on “Garfield and Friends.” The recent CGI series “The Garfield Show” takes a funny shot at Binky, explaining his lack of appearances in that show. Jon asks Garfield if he wants to watch Binky; Garfield responds that Binky’s been contractually barred from appearing on the show. The “Scaredy Cat” song, and the other “costumed” creatures Garfield and Odie encounter. The entire abandoned house scene. “Garfield’s Halloween Adventure” was a staple on CBS for years. Unfortunately, it hasn’t aired regularly on television since the early 2000s.